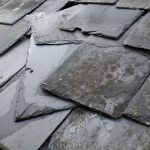 A home in Leeds which had succumbed to internal damage from damp rising from the ground was repaired and protected against future damage as DPR Leeds Roofs worked from the ground up for a change. Inspection of the damp walls in the lounge found a hydrostatic damp problem, which was confirmed by the heavy water presence to the outside of the property. The hydrostatic dampness was affecting the walls to a large degree by severe salting of the plaster work caused by chlorides and nitrates from the ground beneath. To make sure the job was done thoroughly, all the fixtures and furnishings were removed including the radiator, fireplace and skirting boards. The DPR Roofing team in Leeds then removed all the defective wall plaster and cleaned the slating with a stabilisation fluid. The wall was then fitted with our own hydrostatic damp proof membrane system and completed with a new plaster finish. Finally, the radiator and fireplace was refitted by DPR and new electrical sockets and skirting boards were fitted to the previously damaged area to leave the house looking as good as new, and most important of all, dry. Rising damp is a common problem to homes, particularly in a high proportion of older buildings. If your Leeds home is suffering from damage caused by damp or you’d simply like to prevent the problem from ever occurring then we have a number of damp proofing options available – call DPR Roofing Leeds on 0113 3350 043.